Elder Jairo Mazzagardi knows what it means to make sacrifices in the service of the Lord. In 1990, Elder Mazzagardi received a phone call from President Thomas S. Monson, then a counselor in the First Presidency, who called him to preside over the Salvador Brazil Mission. At the end of the phone call, President Monson offered Elder Mazzagardi time to consider the calling. But Elder Mazzagardi and his wife had decided years earlier that their lives would be consecrated to the Lord, so he accepted the call on the spot. “Whatever the Lord needs of us, we’re ready to go,” he says. Before his call to the Second Quorum of the Seventy, Elder Mazzagardi served as bishop’s counselor, high councilor, counselor in a stake presidency, stake president, regional representative, Area Seventy, counselor in the Campinas Brazil Temple presidency, and president of the São Paulo Brazil Temple. 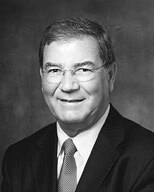 Elder Mazzagardi, an entrepreneur, spent part of his career in the meat industry and later owned a real estate company. He also served in the Brazilian army as an artillery sergeant from 1965 to 1966. He was born to Antonio and Margarida Mazzagardi in April 1947 in Itú, Brazil. He grew up there and in Jundiaí, Brazil. He and his wife, Elizabeth Ienne, met as children and were married in Hoboken, New Jersey, USA in July 1970. Although for years they were not interested in the Church, after the Mazzagardis returned to Brazil, a friend invited them to attend the São Paulo Brazil Temple open house. There, both had powerful spiritual experiences. They were baptized on October 31, 1978, and sealed as a family in November 1979. The Mazzagardis have three children.